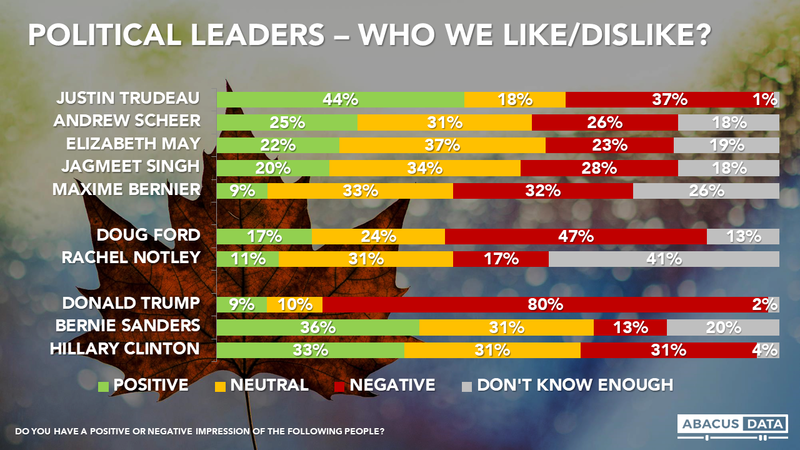 In Ontario Doug Ford is 24% positive – 51% negative (-27). Once a star, Doug Ford is now a case. It happens to all leaders, but as it ever happened as fast?? He has basically only been in office for the summer and already the province hates his guts. At this rate the OPC will be even more unpopular then the OLP. If Andrea can fit her issues the next election should be a relatively easy win. It will be interesting to see who will replace him should he lose the next election. None of his current enablers in government will be able to claim even a modicum of integrity. Andrea is not a compelling leader. The NDP will need to do better. It’s unlikely a PC caucus will go into an election with a leader approval rating this abysmal. They’ll ditch him before then.